Coffee district was listed in the 1953 and 1954 Scout Circus programs, but was gone by the time the 1956 Circus came around. 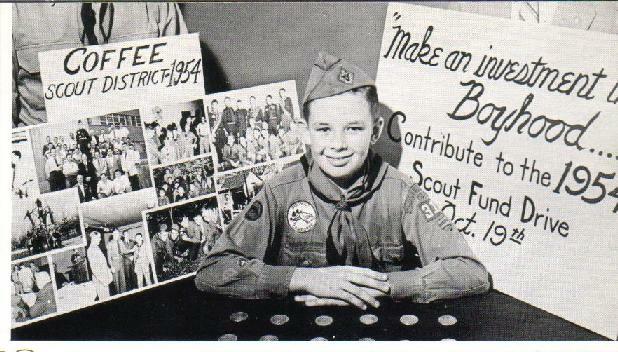 This picture was in the 1970 50th Anniversary of Middle Tennessee Council brochure. 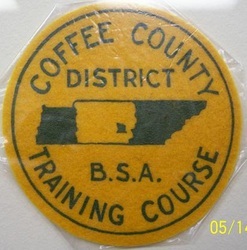 Note that the training course patch calls it "Coffee County District" whereas the scout circus programs just call it Coffee District as does this picture below. My guess is Coffee District was the official name, but since the district was made up of the entirety of Coffee County and nothing else, there was the name confusion. Similar situations existed with Williamson, White, Marshall, Maury, Warren, and Bedford Districts where they were made up entirely of the county matching their name. It is worth noting that none of these single county name matching districts lasted very long. All were extinct by the early 1970s.